Asymmetrical shape provides instant comfort over rocky, wet or sloping terrain and protection from sun, wind, rain, black flies, etc. Features include a patented self-closing entrance through the bottom, which seals automatically and a new comfortable shape to keep your back straight and level when resting on the diagonal. Includes: Attached mosquito netting, detachable rain fly, support ropes, stuff sack and Tree Hugger webbing straps. Weighs 2.9 lbs., Weight limit: 250 lbs., Packaged size: 4"x7"9". 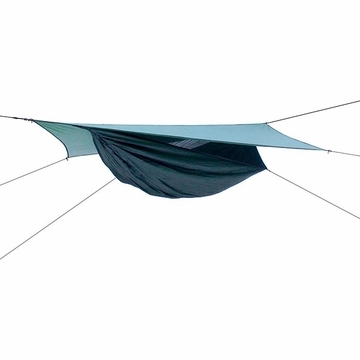 Hammock dimensions: 100" x 52" (diagonal). Materials: 210 Oxford Nylon (hammock), 30D polyester No-See-Um Netting (Mesh), 70D polyurethane coated polyester ripstop (Rain fly).